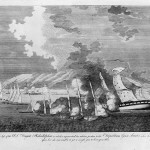 During the blockade of Tripoli, the USS Philadelphia saw heavy battle. One of the confrontations is illustrated here as Tripolitan gunboats fire upon the U.S. warship. In 1803, with Captain William Bainbridge of New Jersey in command, the USS Philadelphia recaptured an American warship from a Moroccan vessel and blockaded Tripoli. When the ship ran aground on an uncharted reef, Captain Bainbridge and the crew were taken captive. This 1836 painting of Bainbridge is by J.W. Jarvis and was engraved by G. Parker. The USS Philadelphia ran aground in 1803 on an uncharted reef during the Barbary Wars and the ship and crew were taken captive. 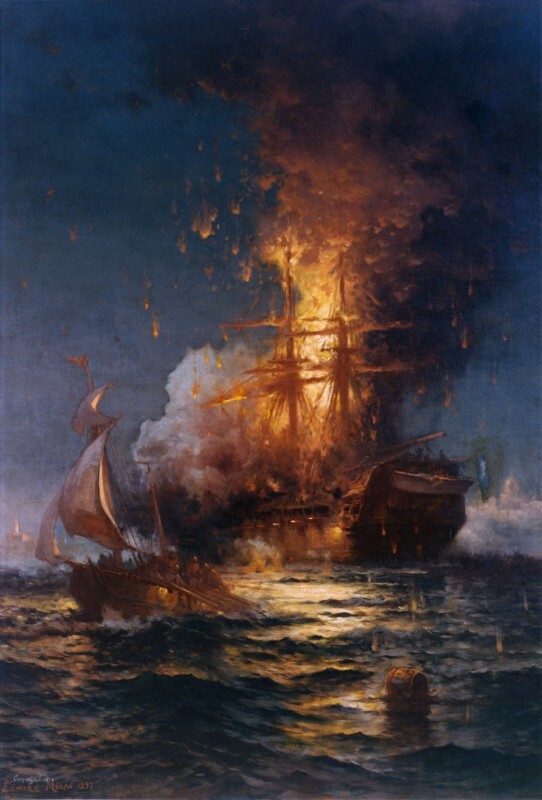 In February 1804, Stephen Decatur Jr. (1779-1820) led a dangerous mission to free the ship from Tripoli harbor, but ended up setting it on fire to prevent its use by the enemy. This drawing from 1855 by Felix Octavius Carr Darley (1822-88) shows Decatur and his men fighting hand-to-hand on board a Tripolitan gunboat during the First Barbary War. 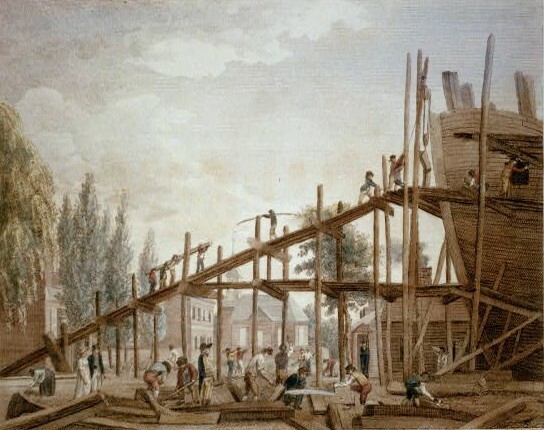 Artist William Birch captured the construction of the frigate USS Philadelphia in November 1798 at Humphrey’s & Wharton Shipyard on Front Street along the Delaware River. The USS Philadelphia was commissioned into the U.S. Navy on April 5, 1800, and destroyed just three years later in the Barbary Wars off the coast of Tripoli. 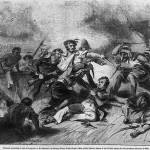 An attack by hostile forces left the Philadelphia severely damaged. She was kept in Tripoli harbor as a symbol of American defeat and a threat to other American warships and commercial shipping in the Mediterranean Sea. 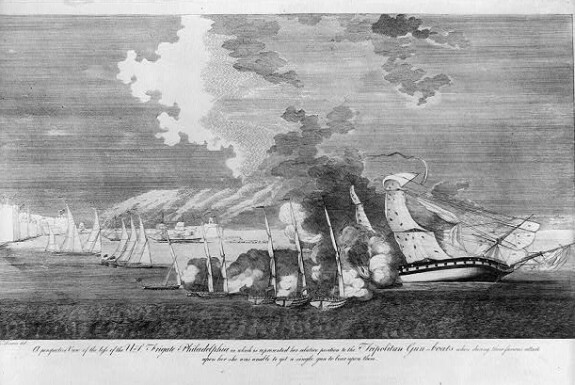 Under the cover of a ship in distress, Americans entered Tripoli harbor on a February evening in 1804 and burned the Philadelphia, marking the end of her short seafaring life. Inspired by patriotic fervor during the Quasi-War with France, the people of Philadelphia raised money in one week during June 1798 to build the USS Philadelphia to help increase American naval power to protect commerce. Completed in 1799, the Philadelphia served in both the West Indies and the Mediterranean Sea, where it was captured in the Barbary campaigns and then sunk by an American force in a valiant but unsuccessful effort to free the ship. The impassioned atmosphere that led to construction of the Philadelphia followed the outbreak of war between France and Great Britain in 1793. Despite a declaration of neutrality by President George Washington (1732-99), the French government authorized seizure of American shipping. When United States efforts to negotiate peace failed, the U.S. and France entered a period of naval conflict known as the Quasi-War in which both sides seized merchant vessels and naval warships. 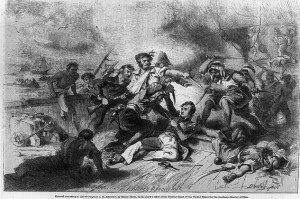 The political temper in the United States became very tense as the Federalists whipped up hyperpatriotism against the French. 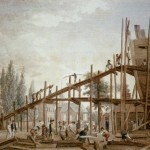 Philadelphians joined a larger movement in American cities to construct ships for the United States Navy, and their fundraising campaign quickly raised the money needed for the USS Philadelphia. Josiah Fox (1763-1847) designed the ship and in 1798-99 Samuel Humphreys (1778-1846), Nathaniel Hutton, and John Delavue supervised construction. Philadelphia was then a preeminent commercial port in America and home to the federal government. As a shipbuilding center since before the American Revolution, the city served as a hub for the U.S. Navy. It contained shipbuilding facilities that not only constructed the USS Philadelphia but also the USS United States, one of the first three frigates built for the U.S. Navy. 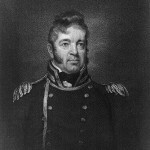 Captain Stephen Decatur Sr. (1751-1808), a Philadelphian, received command when the USS Philadelphia was commissioned in 1800. The ship was then stationed in the West Indies, where it seized five French ships and recaptured six merchant vessels from the French. The USS Philadelphia returned to Philadelphia in 1801, then participated in two tours in the Mediterranean to combat the Barbary corsairs, or pirates, from the North African states of Algiers, Tunis, Tripoli, and Morocco, who preyed on American and other ships. The USS Philadelphia cruised near Gibraltar and blockaded the coast of Tripoli. 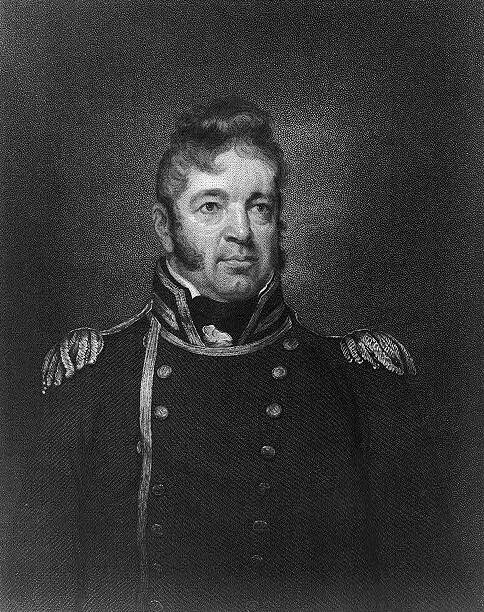 In 1803, with Captain William Bainbridge (1774-1833) of New Jersey in command, the USS Philadelphia recaptured an American warship from a Moroccan vessel and blockaded Tripoli. When the ship ran aground on an uncharted reef, Captain Bainbridge and the crew were taken captive. 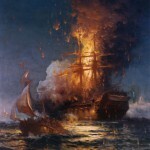 In February 1804, Stephen Decatur Jr. (1779-1820) led a dangerous mission to free the USS Philadelphia from Tripoli harbor, but ended up setting the ship on fire to prevent its use by the enemy. Nathaniel Conley is a doctoral student at the University of Arkansas whose research focuses on the border between Maryland and Pennsylvania with emphasis on the lower class and the border between slavery and freedom. DeConde, Alexander. The Quasi-War: The Politics and Diplomacy of the Undeclared War with France, 1797-1801. New York: Scribner, 1966. Elkins, Stanley and Eric McKitrick. The Age of Federalism: The Early American Republic, 1788-1800. New York: Oxford University Press, 1995. Lambert, Frank. The Barbary Wars: American Independence in the Atlantic World. New York: Hill and Wang, 2007. Palmer, Michael A. Stoddert’s War: Naval Operations During the Quasi-War with France, 1798-1801. Columbia, S.C.: University of South Carolina Press, 1987. Toll, Ian W. Six Frigates: The Epic History of the Founding of the U.S. Navy. New York: W. W. Norton and Company, 2006. Wheelan, Joseph. Jefferson’s War: America’s First War on Terror, 1801-1805. New York: Carroll & Graf Publishers, 2003. John T. Towers, Documents, Official and Unofficial, Relating to the Case of the Capture and Destruction of the Frigate Philadelphia on the 16th February, 1804. Washington, 1850. Independence Seaport Museum Archive, Penn’s Landing, Philadelphia.